I repeat the same motion. I hug her tightly, and smell her messy hair. She smells like strawberry purée. Who knows where her searching hands have been all day? She is constantly seeking jellies and candies. We laugh together, after we exchange our bonding moments. Hundreds of olfactory receptors engage in our chemical sense known as smell. If one possesses an intuitive sense of smell, it could be his powerful resource of insight, and intuition, or a major distraction. One of my inspirations that triggered my move to Hawaii was my Armani perfume. I used it for pethe first time when my fiancée gave me one as a gift. It became my instant favorite. Not long after, we got married and went to Hawaii for our honeymoon. I was spraying that perfume on me every morning I woke up on the Hawaiian island for two weeks. Fast forward about 8 years. I would be packing in my unstable mental condition. I did not know where I was moving to, but I was compelled to pack anyways. That was when my Armani perfume resurfaced opening the path to Hawaii. The fragrance resurrected all my memories of the paradise island. I accepted it as a sign confirming my move to Hawaii and I did make my move. Sometimes, when your reasoning is malfunctioning, you have to rely on your senses. Take a cue from a source you know you cannot mistake. For me, it is a sense of smell. I hope you don’t picture me sniffing around like a search dog. I assure you I cannot locate a lost person, or bags of cocaine. I am not that good. But I rely on my sense of smell when I miss my mom. I remember her smell. I know how she smells. Remembering the smell of streets of Seoul is sometimes enough for me to satisfy my deep longing for my previous life in Seoul. I still love the smell of baked biscuits. I remember the sweet aroma of my favorite incense that I used to burn in my writing room in Tennessee. I remember the smell of the freshly washed sweater my ex-husband used to wear in winter and I remember the comfort and warmth when he held me in his arms during the cold winters. That was my southern life at its best. I remember how the fresh Kona coffee used to smell when I walked into the Cafe I managed on the Big Island, and soon, a satisfied smile surfaces on my face. All those smells in my memories remind me that I had lived a good life. I often fall back into those arms of good memories when I feel weary. Just like the perfume evaporates over time, the memories of my past are finally fading. They are neither strong nor influential. They’re just there reminding me of some things about my life. They tell me that if I have made this far, then yes, I can make it all the way to the end. They remind me that if I hadn’t loved so much, I wouldn’t have felt all that pain, and it is because I have loved that I remember those moments now. Of course they also tell me about a simple fact that I love biscuits. Feeling sad and lonesome, and in need of company? There’s a simple answer for that. Just bake some biscuits. You just bake yourself some buttery southern biscuits. Give your mind something good to remember, something on which your weary mind can rest. And pray that Jesus holds you in His strong arms. I returned to crying some more until the complete peace filled my heart once again. I knew that I was finally at peace with my past. Before I left the chapel, I inhaled the smell of the incense that filled the peaceful space. I would remember this smell. I would remember this peace. This is a beautiful post, and you made a very insightful observation: Sometimes, when your reasoning is malfunctioning, you have to rely on your senses. The sense of smell can be powerful. It can evoke a memory so very strongly. When I was a very small child, I lived in Los Angeles. We drove across the country to Massachusetts to visit my grandmother in the summer. She had a huge garden, with some prized raspberry bushes. In the morning we would follow her outside like little ducklings, and she would plop the fresh-picked raspberries into our mouths. Decades later, I was all grown with kids of my own, and we planted a raspberry bush. When it bore fruit for the first time, I picked on, warm from the sun, and was instantly transported in my mind to that long ago time. I could hear her gentle voice, hear the buzzing bees, smell the berries, feel the warm humid morning sun and the wet grass under my bare feet. My grandmother is long since passed away, but the smell of the berries brought her back, with a memory that I had otherwise forgotten. We humans don’t always think about using our sense of smell, we focus on sight and sound the most, I think. 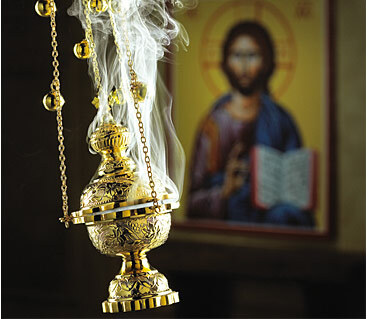 I love the association you made with the incense–and that is the perfect photo! What a beautiful memory to rest your mind on! Grandmothers always provoke a sense of homecoming, I think. I have always felt more grounded when my grandmas were staying at our house in my childhood. Thank you Diane. Peace be with you!